WARNING AND DISCLAIMER: This post contains excess skin and medical photos. If you do not like less than aesthetically pleasing photos then this blog entry isn’t for you today. So I finished my last blog post as I head off to the hospital for the big chop chop. I got there at 1pm to be “checked in” and head up to my room. It wasn’t the ritz but it was a single room and comfortable with all the facilities I need to receive hygienic quality health care….and that’s what I was there for not a holiday at the Hilton. And that long nervous wait began!! I was third on the list so Jamie and I just had to sit around and wait until I got my 10 minute warning to gown up, put on my TEDs and get ready to head off to theatre. I go the call up just before 3pm and in the process discovered not one but TWO non scale victories along the way! And the second non-scale victory is that a standard size bloody pressure cuff fit around my arm. I have my entire adult life needed an XL cuff to get around my arm! So off I went to theatre where the fun all began, I got marked up and knocked out ready to bid Bertha one final goodbye. My last words to my amazing surgeon was I wanted a picture of Bertha “off body” and I wanted to know how much she weighed. Weighing in at slightly under 3.1kg….as Lachlan said. Mummy is getting a new belly and the old stinky sore belly is going in the bin. BYE BYE BERTHA…..I won’t miss you one little bit!! I woke up in recovery I had the loveliest cheeky nurses looking after me who told me that all went well and then decided to give me the code word of “taco” that I had to remember. Once I had dropped the random code word test on me 5 times and all my obs were stable I was back on the ward within 30 minutes of leaving theatre. A quick bite to eat I had settled in for the night with half hourly obs for the first 4 hours on the ward then hourly obs for the next 4 hours. And in that time I had already commenced my mobilisation by walking to the toilet for a wee since I was lucky enough to dodge the need for a catheter in surgery. By 2am I was able to snuggle down and have a couple uninterrupted hours of sleep. Woke up in the morning feeling surprisingly good, much much better than I expected. Not excessive amounts of pain, just a weird ache and discomfort from the drain site. Those pesky drains where what was giving me grief. I had my first shower and when drying myself and my dressing off with the hair dryer I got you first sneaky peak of my new belly without Bertha! And I could do my first real post-Bertha comparison shot – it’s hard to believe these photos are less than 48 hours apart! My drains took a while to get going but once they got going they were running a little bit too enthusiastically to the point that they needed to stay in longer than anticipated. They were supposed to come out Day 2 but they just weren’t ready with too much discharge still being drained. Day 2: I had a bit of an incident with the right drain thanks to the drainage tube being blocked with a clot when I got up to go to the toilet all of the backlog of fluid actually drained out through the drain hole all over me, my bed, the floor and legs just say I was not the cleaners favourite patient that night! Once we got the drain replaced and the tube cleared we were back in business and it was draining again. Pain wise I was still comfortably being managed with a combination of endone and tramdol, while still not experiencing excessive amounts of pain it’s just a continual throb and ache along the incision but mainly where the drains are. And life was good as even though I got booted out of my own hospital bed I had my favourite visitor of all visitors come in to see me! Day 3: I was elated to have my left drain removed. Which when coming out we discovered I must have had a similar style blockage and when the tube was pulled out the “drain hole” became the a drain. Over the next 4 hours everytime I stood upright I had a gush of Fluid expel from the body. It got the point everytime I was about to stand up I called the nurse and had her on standby mode to prepare for onslaught of mess. She estimated I lost another 40-60ml of Fluid using this unconventional method of leaving the body. Yes, it wasn’t ideal. 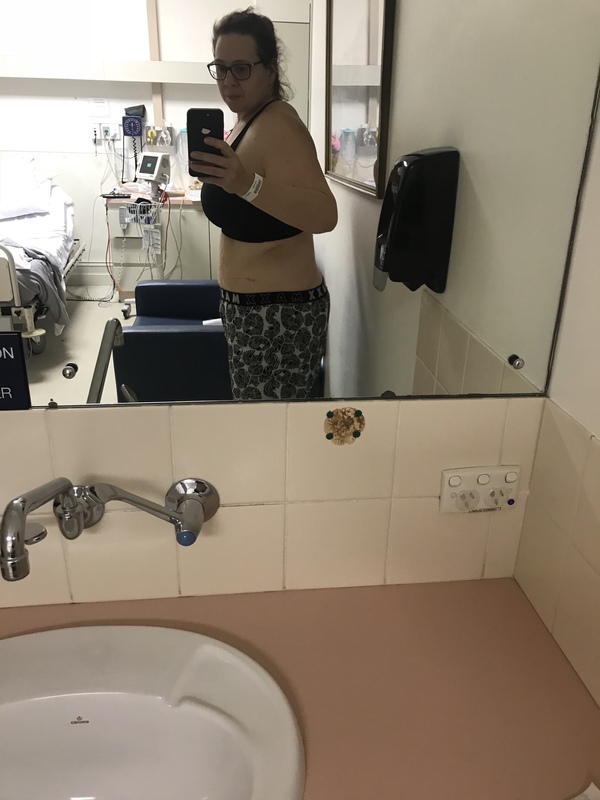 Yes, it was revolting….BUT I couldn’t give two hoots as I would much rather the fluid be out of my body making a mess on the floor than to collect internally to potentially cause any complications to my surgery. Once I finally stopped leaking I was able to have a clean up shower where I really had the first opportunity to stop and look at myself. And I am not gonna lie I was shocked with what I saw. I didn’t got in with any expectations of what I wanted to look like after my surgery for 2 reasons. Firstly, I didn’t want to set expectations so that I didn’t feel disappointed with the results. Secondly, I honestly didn’t know what to expect. I was acutely aware I wasn’t having a tummy tuck. I was having an apronectomy and this isn’t a common or widely talked about procedure. It’s a rare procedure offered as an interim fix to those who have lost extreme amounts of weight and are suffering severe secondary medical problems as a result of the excess skin. It’s offered to help me get to the point of being at goal weight and stable to be eligible for the standard tummy tuck procedure. I knew I wasn’t going to come out with a flat washboard contouring tummy and I was comfortable with that. So what was my first impressions of my results so far! Shock, delight, joy, pleasure, happy tears and disbelief that this is my body! Bertha is officially gone and I don’t miss her one little bit! And I can honestly never remember in my entire adult life my stomach ever looking so flat! Day 4: this was my rough day. People had warned me about the day 3 blues and for me (probably because I had a PM list) it hit day 4. Day 4 I hit the slump day. My pain was no better or worse than previous days. My mood however was less than desirable, I was simply put….over it! I felt fine and healthy enough to go home. I was sick of laying around in bed all day doing nothing. My little man was missing me terribly to the point he wanted me to leave hospital and start walking home. I was over the watching the numbers of the drains and begging them to stop draining so I could have them removed. I just was over it….I wanted out! Day 4 I survived! Day 5: this amazing man made me the happiest girl in the world! This is my surgeon Dr Darren Molony from Adelaide Plastic Surgery. Not only is Darren one of Adelaide’s best surgeons who specialises is body contouring post extreme weight loss he is a kind and caring surgeon who has the best outcomes in mind for his patients. Every nurse I had made comments of how well I did with selecting my surgeon and that he is by far one of the best in his field! Thank you Dr Molony for being so bloody good at your job and THANK YOU THANK YOU THANK YOU for giving me the all clear to have the second drain removed and for me to go home! I am so lucky and grateful to have had all amazing supportive and kind caring nurses in my 5 days. While the facilities at the Memorial Hospital are a little dated this what not my priority. My priority was to receive safe, quality and respectful care and this is exactly what I received and I am so very thankful for all the staff for looking after me so incredibly well! And my chariot awaits!! Jamie is taking me home for the next stage of my recovery. And Bertha…..well she gets left behind. In the bin. Where she belongs! !